When it comes to addictive timed games, Popcap games is at the top fo the radar. They already have hits out there like the Beweled Series and Plants vs. Zombies. They keep us entertained. And they are constantly adding new games. I don’t usually play Facebook games. Facebook is enough of a distraction without adding games to the mix. 🙂 So, I was not too familiar with the Solitaire Blitz game. However, I do play games on my iPad. I love timed games, or games of strategy. And I have always loved card games. Back before having access to endless gadgets, I would use an actual deck of cards (remember those?) and I could play Solitaire and Freecell for hours on end. Solitaire Blitz incorporates all of my favs. It takes the favorite traditional game of solitaire and turns it into a fast paced thinking game. The object is to attempt to clear all of the cards before time runs out. There are 60 seconds on the clock by default, but you can earn more by clearing cards, or purchase more time with silver coins. Like traditional solitaire, you are presented with card stacks that you need to move around and *clear* by stacking cards on top of each other in order. However, unlike the regular games, you can stack backwards. And the Joker can be used as a wild card. You can choose to play stand-alone. However, if you login with your Facebook account the game score carries over from Facebook and you can take it with you. 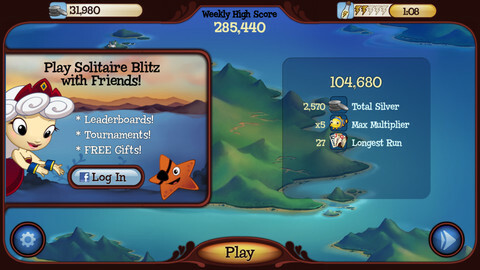 You will also see the scores of your friends who play the game on the leaderboard. Make it a contest! High Speed Meets High Stakes: Clear the decks in just 60 seconds. Score big bonuses for long winning streaks, accuracy and more. Amazing Achievements: Unlock a boatload of new in-game achievements, including awards for accuracy, win streaks and high scores. Fun with Fishy Friends: Get to know Pearl the mermaid, Otis the worm, Noodles the octopus and many more as they provide tips, tricks and score multipliers! A Trove of Treasures: Collect treasures, hunt for rare trinkets and earn coins to purchase boosts that supercharge your game. Fun, Social and Competitive: Connect to Facebook to compete with friends and battle it out for leaderboard supremacy! The one *complaint* that I have about the game is not actually a complaint. LOL! However, if you play until all of your energy runs out, you have to take a break and wait for it to build up again, or purchase more energy with an in-app purchase. It teaches patience, or… it makes you spend money. However, the game is free, so some folks have no problem spending a little money for an in-app purchase to make their favorite game more fun. Check out the video below where I talk a bit about how the game works. Download Solitaire Blitz for free in the App Store. The games works on iPad, iPhone and iPod touch. Disclosure: This review is sponsored by Popcap games. All opinions (and addictions) are my own. Solitaire Blitz is ultimate game to play. I get help of gameskip for fantastic level up.